In honor of our nation declaring its independence from England, I hereby declare my independence from Austin, Texas. The moving van is literally taking our stuff from our house in Austin on the Fourth of July. How fun is that?! This recipe is from my cookbook Well Fed: Paleo Recipes For People Who Love To Eat. The sweet surprise on the spoon with this dessert is the luxuriousness of whipped coconut milk. Chilled and flavored with a hint of almond, it’s luscious and feels decadent. No sharing necessary. This requires a bit of forethought: place a can of coconut milk in the refrigerator, ideally overnight, but 3-4 hours will do. You also need to make a quick batch of Caramelized Coconut Chips. When you’re ready to eat, put the can, a metal mixing bowl, and beaters from the mixer in the freezer for 15 minutes. While the coconut milk is chilling out in the freezer, gently wash the fruit and pat dry with paper towels. Heat a nonstick skillet over medium-high heat. Add the sliced almonds and stir continuously with a wooden spoon until the almonds turn golden brown, about 3-5 minutes. Don’t get distracted because they can change from toasty to tragic in a heartbeat. When the coconut milk is cold, turn the can upside down, open it with a can opener, and pour off the watery liquid. Scoop the thickened coconut milk that remains into the chilled mixing bowl and add the almond extract. Whip on your mixer’s highest setting until the milk is fluffy and has taken on the texture of whipped cream, about 5-7 minutes. Marvel at the creaminess! 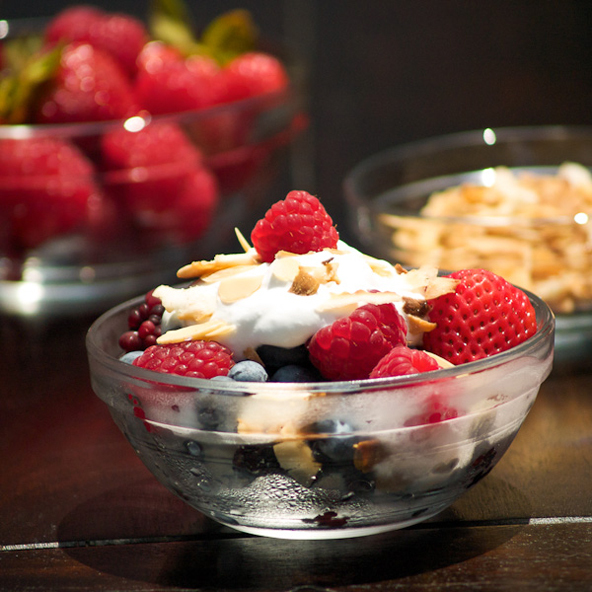 Divide the berries among four bowls, then top with a dollop of whipped cream. Sprinkle each bowl with some of the toasted almonds and caramelized coconut chips. Eat your dessert slowly with a spoon — then lick the bowl. Leftover whipped cream can be covered and stored in the refrigerator for about 3 days. I’m having trouble getting the coconut milk to separate, even though it’s been in the refrigerator for several days (and I’m sure noone’s been shaking it). Is there anything else I should think about? I choose organic coconut milk with as few additives as possible, in metal cans. Some brands just won’t do it… sadly, the higher quality, organic, no-junk kind usually doesn’t separate. The cheaper kind works better. I’ve had good luck with Polar.